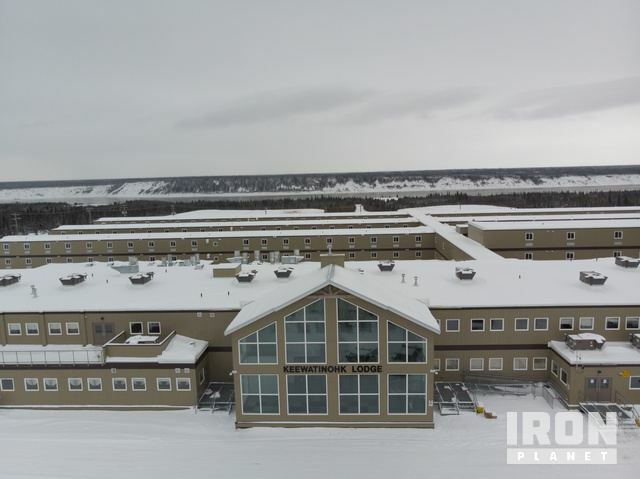 Ready for immediate sale and removal, this state of the art customized 250,000 sq ft camp facility manufactured by Kent Commercial and Maple Leaf Homes. This home away from home design has all the comforts of a hotel plus setting placing a priority on natural light and open seating concepts. The facility consists of 596 bedrooms, a gymnasium with an NBA regulation size basketball court and 2 squash courts. A two-storey core complex with recreation center and lounge with floor to ceiling stone fireplaces, a movie theatre, dining area and commissary. The facility has a cultural centre space for functions and training needs.The camp also includes an on-premise industrial laundry room and separate facilities for emergency response/fire hall and water treatment. The bedrooms all have private baths with hotel quality furnishings and housed in three story buildings connected with multilevel arctic corridors and serviced by elevators. Buyer’s responsibility includes dismantling entirety of camp. Buyer assumes full responsibility for load out, any scrapping of camp equipment or materials and transportation for scrapping and/or relocation to destination .